The Mills College Amnesty International Student Group, a new club, recently hosted the Amnesty International’s Northern California Training at the Graduate School of Business (GSB). The event was on Feb. 2, a rainy Saturday from 9:00 a.m. to 5:00 p.m. 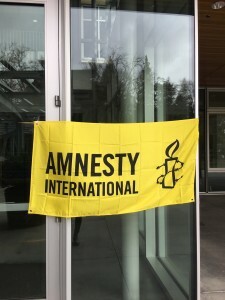 The event was facilitated by human rights activists from across Northern California and highlighted a few of the recent campaigns that Amnesty International is focusing on, such as advocating for migrant and refugee rights and increased gun control measures. The event was divided into three lectures, the first centered on the rise of border enforcement that is happening worldwide and the negative impact this is having on migrant and refugee communities. This talk emphasized the need to remain globally conscious of the growing autocratic regimes that are fueling anti-immigrant sentiments that blame incoming vulnerable communities for economic disparities and contribute to social instability. The following lecture highlighted a recent action that the Amnesty International chapter in Stockton, CA took to collectively mentor a refugee family. The process of mentoring requires less of a financial commitment than hosting a family, as the federal government subsidizes a larger part of the housing and processing fees. The Stockton chapter shared the organizing strategies they employed to fund-raise, and help provide basic goods for the incoming family. They partnered with local community centers to provide social services to immigrant and refugee communities regardless of citizenship status, including employment petitions, language and legal assistance. They highlighted the importance of this work considering the federal government’s significant cut to refugee admissions. The final lecture shared information on Amnesty International’s campaign for stronger gun control. They shared news of successfully campaigning to overturn Ohio’s “kill at will” law, similar to Florida’s “stand your ground” law, that would enable gun owners to shoot others, in response to feeling threatened. However, unlike the Florida legislation, this would have expanded gun owner rights by allowing them to shoot others regardless of their location, therefore not limiting them to being on their property. Additionally, Amnesty International shared another successful campaign to pass the Illinois “Curb the Sale of Illegal Trafficked Guns” Senate Bill 337. This legislation increases regulation on gun dealers by having them comply with “common sense” gun control measures such as requiring gun dealer employees receive background checks, annual training to ensure that they are operating in compliance with legal mandates, safety measures such as locks and safes for firearm storage, and prevention of dealerships from opening within 500 feet of a school or daycare facility. Following the lectures, the Northern California chapter of Amnesty Internal broke up into discussion groups to plan the next steps for current and upcoming campaigns. 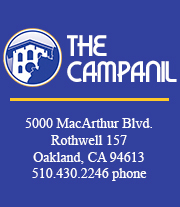 When they regrouped, they collectively shared their ideas for a larger Northern California campaign coalition that centered on continuing the advocacy of immigrant and refugee rights, LGBTQ rights and increasing gun control. “When I heard about [Amnesty International club] I immediately wanted to join because I have a passion for social justice and human rights,” said Amnesty club Secretary Meredyth Cohen. The adviser for the club is Professor Martha Johnson, who was also in attendance at Amnesty International’s Northern California Training. Johnson is looking forward to supporting students in pursuing their campaign goals. “I think students may not realize that Amnesty is truly international and has US-focused projects, as well as international ones. … It is a member-driven organization with activist groups all over the world. It’s a great way to become part of a transnational activist network advocating for the rights of all people regardless of gender, ability, nationality, race, ethnicity, sexual orientation, immigration status, religion, and political belief,” Johnson said. The event concluded, and provided new members in attendance with a broad horizon of possible club campaigns and initiatives. 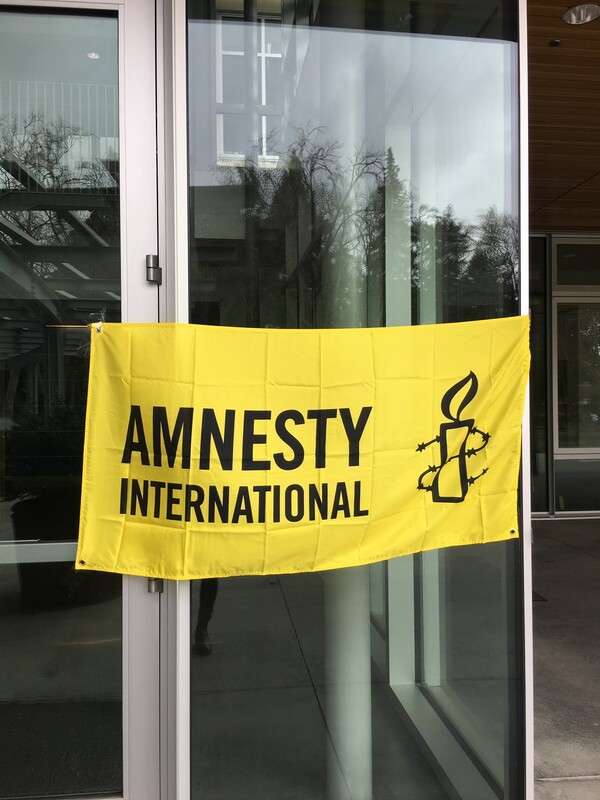 “We were delighted to host the training event for all of the local Amnesty International groups in Northern California at Mills on Feb. 2 as our first club action. For more information about Mills Amnesty, or to get involved with the club, please email me at: ashouse@mills.edu,” Shouse said.